THE FACULTY of Asbestos Assessment and Management (FAAM), Asbestos Control and Abatement Division (ACAD) and The National Organisation of Asbestos Consultants (NORAC) have formed a collaboration to bring a new skills certification card, displaying the CSCS logo, to Asbestos professionals. The project brings together organisations representing consultancies, Licenced Contractors and Asbestos professionals for the first time. 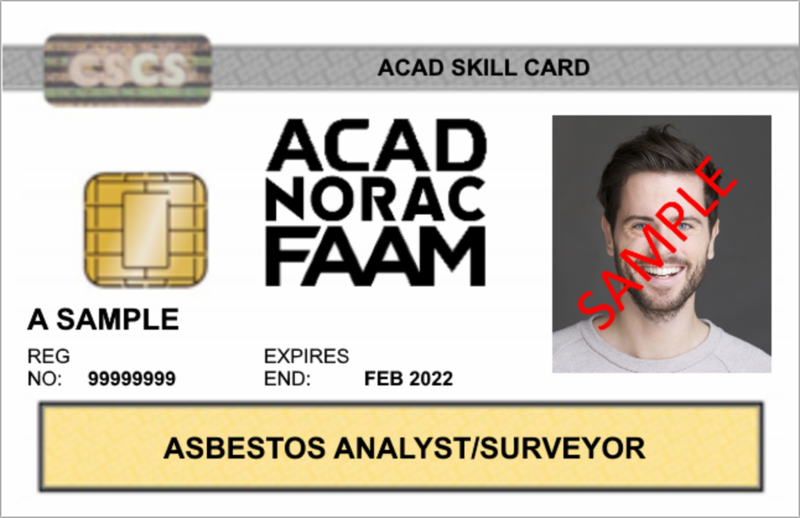 NORAC board member Jonathan Grant said: “We are delighted to be working in collaboration with FAAM and ACAD issuing a card displaying the CSCS logo to support asbestos surveyors and analysts gain access to numerous construction sites. At the beginning of 2015 the Construction Leadership Council (CLC) announced that industry should only accept card schemes carrying the CSCS logo with no equivalents accepted. This is known as the One Industry Logo action and was undertaken as a response to the UK Government’s Industrial Strategy: Construction 2025. In order to qualify for the CSCS logo all card schemes must meet a number of requirements set out by the CLC that include, agreeing appropriate qualifications for each occupation and setting a minimum standard for skilled occupations at NVQ level 2. CSCS director of operations Gordon Jenkins said, “It’s great to see ACAD, BOHS and FAAM working together bringing asbestos analysts, surveyors and removal professionals together.